1. Select a PC that will be active all the time, with a static IP, so it can provide licenses to all installations of SoliCall Pro. 2. On this PC first install the professional version of SoliCall Pro that you received from us. Afterwards, extract to the directory “C:\Program Files (x86)\SoliCall\bin” the license server files you received from us. 4. Go to “Tools->License server” and write the IP of the license server machine. Note: Once the license server is started, it takes it 5 minutes until it will provide licenses to SoliCall Pro instances. Now, this error message will disappear. In addition, you should also be able to see the actual usage count on the license server increasing. Next step is to make sure the desired audio filtering options are selected. This is done via “Tools->Options…”. 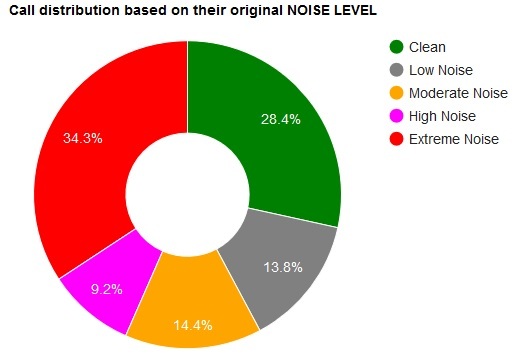 Usually we recommend to: (1) disable echo cancellation since the agents are using headsets and (2) enable AGC to keep volume level at a comfortable level for both the agent and the customer. That following configuration item is to make sure the audio devices on the PC are set correctly. On the Windows sound menu, make sure that “SoliCall Audio Device” is at “Ready” state and is not selected neither as the “Default Communication Device” nor as the “Default Device”. Open the audio settings of your softphone and change its Microphone and Speakers to be “SoliCall Audio Device”. 1. PBXMate could be run on any server in your network. We recommend that this server will have at least 4 CPU cores and 4G RAM. 2. The network between the Agent’s PCs and the PBXMate server should be fast to avoid delays to the audio. 3. The IP of the PBXMate server should be static. 4. Make sure there are no firewalls that might be blocking the communication between SoliCall Pro and PBXMate. 5. VMware player/workstation or any other VM software that can import files in OVF format. 1. Download the VM image of the PBXMate server. 2. Configure the VM to use the hardware of your server and launch the VM. 3. On any PC, open a web browser and navigate to http://[Server IP]:8083 . Using the browser you can control and monitor PBXMate. Note: if you do not know the server IP, you can login to the server and the IP will be displayed on the welcome screen. On each installation of SoliCall Pro, go to “Tools->PBXMate”, check “Use PBXMate” and update the IP of PBXMate server. Note: if the IP of the agent’s PCs is not fix, then select “MAC” for the Station Identifier. In addition to listening to the audio “after” filtering, you can also compare the audio “before” and “after”. In order to do so, you will need to activate recording in SoliCall Pro, both the regular recording and also the “extended recording” (via “Tools->Advanced Options…”). Once you do so, SoliCall Pro will start recording the calls. Contact us to get a utility (“parse_recording_dir”) that will generate from the recorded data audio files of “before” and “after”. The standard setup will mainly attenuate ambient voices of other agents talking over the phone. In addition, if you want to cancel voices of people that are not talking over the phone, for example the voice of the supervisor shouting instructions, please contact us and we will guide you on the required setup. For heavy production load, please contact us to discuss the required specifications for the PBXMate server. 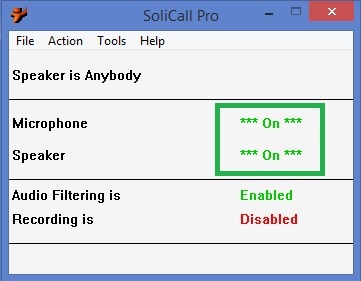 If during a phone call, SoliCall Pro is unable to communicate with PBXMate for more than few seconds, a warning message will be displayed (“PBXMate is temporarily disabled”) and the audio will be filtered by SoliCall Pro without PBXMate filtering. If you receive such a message, please verify that (a) no firewall interferes with the communication between SoliCall Pro and PBXMate and (b) the maximum allowed number of concurrent calls was not exceeded.